This recipe for pinto bean enchiladas is perfect for those days when you’re busy running errands and don’t have the time to cook a more complicated lunch or dinner. Unfortunately for me, this seems to be my case more often than not! Whether it’s because of more traffic, or poorer customer services in stores, things seem to take longer than they really should when running around town doing errands, and you end up getting home very late and with little time to prepare any food. The easiest thing to do for some people is to stop by a fast food restaurant and grab a meal to-go, but I’m always craving homemade food, and thankfully my pantry is always stocked with a couple of items that are perfect for these kinds of situations. For this recipe, for example, I will be using HERDEZ™ Traditional Instant Refried Beans. They’re made using pinto beans and a hint of salt to give them that home-cooked taste. The beans come in a small, sealed packet and are available in several flavors (I used the Traditional flavor). If you’d like to check them out for yourself, visit the bean aisle of a store near you; I know you’ll love these tasty refried beans! I will also be using a bottle of HERDEZ® Salsa Verde, which is made with just five simple ingredients: freshly harvested green tomatillos, savory onions, spicy Serrano peppers, salt, and fresh cilantro. Couple these products with some corn tortillas (which I always have in my fridge), and this dish will be ready in a matter of minutes! 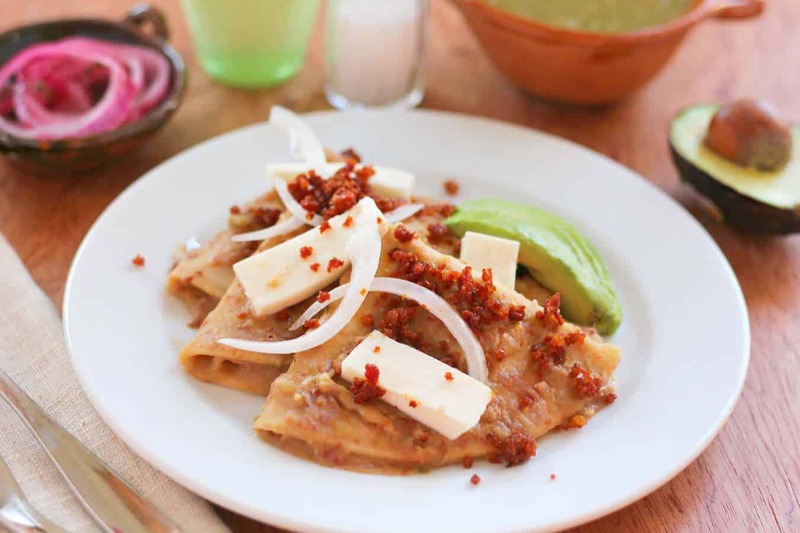 When making this recipe, I couldn’t decide if I wanted to make enchiladas or enfrijoladas, so I combined the beans with the salsa to make these delicious Bean Enchiladas that are folded into triangles and topped with onions and slices of Queso Fresco. Enchiladas like these, which are folded into triangles that look like a handkerchief, are common in the central states of Mexico, like Michoacán and Puebla. They can be found covered in a variety of different salsas. The HERDEZ® Brand is Mexico’s #1 Salsa Brand. My family in Mexico uses them regularly. If you ever visit Mexico City, I hope you stop by the HERDEZ MUSEUM, where you will enjoy a large display of the History of Mexican Gastronomy. In a skillet, prepare the HERDEZ™ Traditional Refried Beans according to the package’s instructions. Add 1 cup of HERDEZ® salsa verde and 1 cup of chicken broth to the beans and mix. Cook for 4-5 minutes to allow all the flavors to blend. Season with salt. Heat the oil in a small frying pan and lightly fry each tortilla on both sides. Place them on a plate. Using a pair of kitchen tongs, dip each tortilla into the bean mixture. Place the tortillas on a plate and fold them into quarters. Add a slice of queso fresco inside each tortilla. Garnish with Mexican cream and onion slices. If using the avocado and chorizo, top the enchiladas with them or serve them on the side. Serve the rest of the HERDEZ® Salsa Verde on the side and enjoy your Pinto bean enchiladas! This recipe for pinto beans enchiladas is perfect for those days when you’re busy running errands and don’t have the time to cook a more complicated lunch or dinner. The creamy mixture of beans and green salsa pair wonderful with corn tortillas topped with Queso Fresco. If you regularly buy HERDEZ® Brand Products visit their FACEBOOK page, they are giving you a chance to WIN $300 and a year’s supply of HERDEZ™ Instant Refried Beans. The only thing you have to do is share a recipe using Herdez Salsas & Herdez Instant Refried Beans ON FACEBOOK OR INSTAGRAM, tag with #FrijolesConTodo & #Sweepstakes. Check this Example and check the rules HERE. If you need more Easy recipes, check this list HERE. Instant refried beans! Wow! Tomorrow I’m going to a local Mexican store to get these. Your recipe looks delicious and I’m going to try it. I’m a little confused, thought. Do you just dip the tortillas in the bean mixture? Doesn’t most of the bean mixture come off? Can I put more inside the tortillas? I think I would like more beans and less tortilla. Yes, Instant beans, growing up my dad used to buy these type of beans. And yes, you add more beans to the tortillas when you served them. The beans taste really good! Amo tu blog y recetas!! Love your recipes! I love enfrijoladas these are perfect for a vegan meal by replacing the broth and cheese of course . My family shamed me for trying to buy beans from a bag but a crock pot is the perfect way to make them without the fuss of watching over them. Love the simplicity! No baking? I thought all enchilada recipes ended with baking step. I love Herdez products, but I’ve never tried the refried beans. This sounds like a tasty recipe, I’ll give it a try.